Rebekah Heacock is blogger, traveler and aspiring polyglot who lives in Boston. She previously lived and worked in Uganda, where she co-developed and directed a series of conferences on post-conflict development for American and African college students, and in Kansas, where she was a web producer for a local newspaper. She has a BA in Russian literature from the University of Kansas and a Master of International Affairs from the Columbia University School of International and Public Affairs. Since 2007 Rebekah has researched Internet censorship and the global blogosphere for Harvard University's Berkman Center for Internet & Society. Rebekah also covers the Ugandan blogosphere for Global Voices and writes about technology, aid and development at Jackfruity. 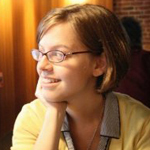 Rebekah served as a researcher during the first phase of the Technology for Transparency Network. Twitter: @rebekahredux.